In this article, we will explore how React and Angular applications compare when it comes to Internationalization (i18n). We will create a sample application in English and then convert the content into a different locale. This article does not go into the details of either of these frameworks but rather focuses on their ability to facilitate i18n and their ease of use. Create an Angular and React application with no Internationalization and then converting them into one with the ability to handle multiple languages. Determine ways to serve the application with minimal overhead. Compare and contrast the i18n capabilities and the ease of use of each framework. Locale: A geographic region or a group of settings that the user has configured or is preconfigured for them eg. en-US refers to American English with the US locale, while en-GB refers to British English with Great Britain locale. Internationalization: Ability of an application to support multiple locales. Localization: Translating the (internationalized) application into a different locale. Finally, include the newly created AppRoutingModule in the main application module found in app.module.ts under the imports section after the BrowserModule. Also, add links in our app.component.html to navigate to each of these components based on the route definition. Run the command npm start from the root of the project and navigate to http://localhost:4200 to see your application running. Now that we have the base application in place, the changes needed to enable i18n are fairly straightforward thanks to the out-of-the-box i18n support provided by Angular. For localizing the application, we need to mark all the text that needs to be translated. In the past version of Angular (i.e. 1.x version a.k.a AngularJS), we were forced to create a json file with our various translations text in English and then provide them to translators who would convert them to whatever language we needed. We then had the ability to dynamically switch the language within our application which was resolved using a translationdirective. Things are a little different in the latest version of Angular. We can still use the old way of translations using a library such as ngx-translate. However, regardless of internationalization, we would want to enable AOT builds i.e. Ahead of Time compiled code so that we can remove any unnecessary payload /code from the final distribution bundle (such as the compiler, additional translation files etc). The downside of this is that we end up with one distribution folder per locale. For this article, we are moving forward with the assumption that our application in production in running in AOT mode. We first need to mark the text for translation using the i18n directive. Using the directive is very easy, we only need to provide the value in the following format and the entire thing is optional. Once we have marked the entire text that needs to be translated, we can run the xi18n command provided by Angular CLI to generate the translations file in any of the 3 supported formats (XLF, XLF2 or XMB) which can be passed to the translators. The generated file also persists the context of the translation such as the location of the translation id, its meaning and description. Running this command creates the XML file messages.en.xlf under the src/localefolder. One caveat to using this translation file as default is that Angular expects a base messages.xlf file which we have renamed to messages.en.xlf instead. So to offset that, we simply need to add the translations to the en locale file which would be same as the source, for example, if we have a source node labeled Home, we need to create a target node with the same label in the generated XML file. Notice that all the sources and the target nodes are the same text in this case. If we now wish to add an additional language, such as French, we only need to get the new xlf file for the same. In our example application, since we do not have access to real translators, we can simply copy paste the English xlf file into a new file called messages.fr.xlf and then append FR- to denote the French translation. Note that the target node is the same as the source node with FR- prefix. To build the code, we typically use the ng build command which accepts optional parameters. In this case, let us make an assumption that during development, we only wish to work with the English version of the application. We make this assumption to avoid changing the angular.jsonfile. 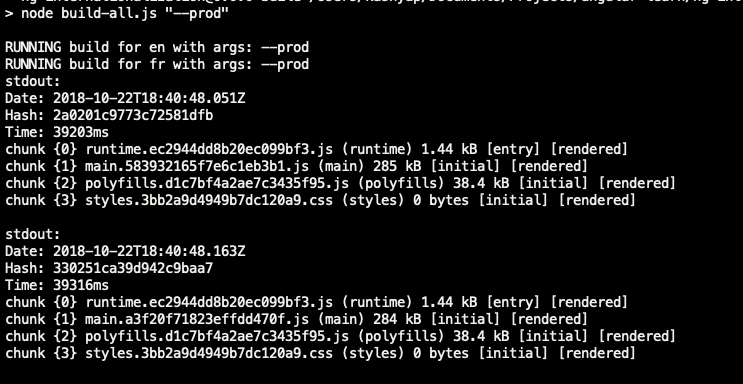 The angular.json file can be updated to create multiple profiles for building and running the application with different locales as shown here. We are going to create a small script which will create builds for all the locales we support by passing in optional locale-specific params to the ng buildcommand. We first add the supported locales list as allLocales to the package.json file which will act as the single source of truth for our application moving forward. We are creating the AOT builds with the base href of the application set to the locale name, that ensures every request originating from the locale-specific template has the locale prefixed to the request. Now that we have locale-specific bundles ready to go, we need a server to check the request that is originating from the browser and then serve the content based on the requested locale or default the user to a pre-determined locale (which is assumed to be en). we simply break down the incoming request to determine whether the request has an existing locale, an unknown locale or if it is a base request to load the index page and then handle it accordingly. We also generate a static path for each of the supported locales and ensure that they point to the right folder under dist. To test the changes, run node server.js from the root of the project and we can see the application start at port 3000. We can see that it not only loads the translations as expected, we also get the localized values for the date, number and currency pipe that we have used thanks to the--i18n-locale flag that we passed in while generating the build. As in the case of the Angular application, we need to first set up the base project which has 3 routes and some basic localizable content on the home page. Then, create the 3 components Home, Settings and About which, for now, look the same. Our base application is now ready to be internationalized. As is the case with most of the React projects, we first need to pick a library of our choice which allows us to perform internationalization. This is not a negative in any way since this is how React was meant to be. In this article, we will be using react-intl which provides the components needed for the localization of messages and react-intl-translations-manager which helps with the generation of the translation files. The enforceDescription flag prevents warning messages in case description is not provided with each of the elements in the App.json file. With that, we have made the necessary changes for marking the content to be available for translations. We are now ready to generate the translations per locale. Similar to the Angular application, let us update our package.json file with a property called allLocales which lists all possible locales that we wish to support. Which will be en and fr for now. To consume these translations now, we are ready to modify the root of our application and provide the translations as necessary based on the user selection. Create an index.js file under locale folder which can export all the available translation messages (en.json and fr.json in this case). Update Home.js to consume FormattedDate and FormattedNumbercomponents along with the FormattedMessage component to show the correct format based on the selected locale. Angular kind of corners you to generate a new distribution per locale which in my opinion is not really the worst idea since there is no overhead at runtime. React, on the other hand, still has to evaluate and re-evaluate all the extra components which are provided by react-intl (which I’m sure to have some form of memoization under the hood). Angular i18n requires a full page refresh when trying to switch the user locale, unlike React. Which could be either an advantage or a disadvantage based on personal preference. In the case of Angular, we need to add a server which can handle and serve the right distribution files based on the selected locale. This means added code, testing etc and your application is no longer a static bundle which is much easier to deploy. Angular provides some common pipes such as number, currency, and date which handle all the locale-specific changes internally unlike react-intlwhere sometimes we need to provide custom formats based on our use case and locale. In the Angular app, if we change the default output file name we need to manually add the targets to the XLF file which is far from ideal and a pain in case there are many translatable fields. In the case of Angular, we need to depend on libraries such as ngx-translate to provide missing functionality such as translating strings which are not already on the template. Making it a favorable alternative over the out of the box i18n. Follow this open GitHub issue to learn more and check out some possible workarounds. Both Angular and React application templates are polluted with translation specific code either as the i18n directive or the use of an additional component. Angular version of the sample was completed before the new Ivy compiler was launched, the payload size with Ivy enabled might differ as it now comes with Tree Shaking out of the box. The code base for both of these example projects is available here: Angular, React.